Sony's start into the world of Digital SLRs was quite a slow paced one. 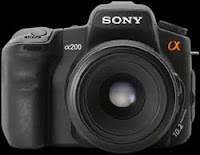 The first Sony branded model, the A100, appeared on the scene in June 2006 and it took over a year for it to be joined by a companion, the A700 prosumer model which was launched in September 2007. More recently though Sony has stepped up a gear and launched not one, but three cameras to replace the A100 - the DSLR A200, A300 and A350. There is now something for everybody in the Sony line-up. The A350 for the feature-loving photographer on a budget, the A200 for those whose number one buying criterion is value-for-money and the A300 for bargain hunters who want a balance of the two. The A200 is, in terms of specification, not a million miles away from the veteran A100. It's got a larger screen, comes with an ISO3200 mode and user controlled High ISO noise reduction but in turn lacks the A100's depth of field preview (it's unsurprisingly much cheaper though).